EUROCOM Panther 5SE Mobile Server with 8 cores,16 treads Intel Xeon E5 processors supports multiple VMs and delivers server-on-the-go capabilities for database/CRM developers, Network Managers, Cloud Computing, Web Developers. 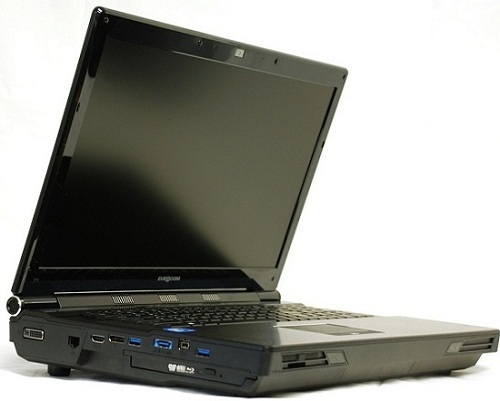 Eurocom is adding the 600 GB and 800 GB Intel Solid-State Drive DC S3500 Series to the Panther 5SE Mobile Server. The EUROCOM Panther 5SE is a 12 lbs, 6 kg Mobile Server equipped with 8 core, 16 thread Intel Xeon Processors, up to 4 TB of RAIDable storage and 32 GB of quad channel memory. The addition to the Intel Solid-State Drive DC S3500 Series to the Panther 5SE gives customers an even greater choice of storage options to go along with enterprise class Intel Solid-State Drive DC S3700 series drives that have been offered for some time. The Intel Solid-State Drive DC S3500 series provides industry leading 20 nm MLC NAND flash memory with consistently low latencies and tight IOPS distribution. Intel DC S3700 and DC S3500 Solid State Drives combine fast, consistent read performance, consistent command response times with strong data protection and low active power levels for low power consumption. Exceptional performance from the DC 3500 series with a very low active read power of less than 1.3 watts mean that it improves server efficiency and lowers costs. To protect against data loss and corruption the DC 3500 series utilizes advanced error correction, such as parity check, Cyclical Redundancy Check and LBA tag validation. Combined with RAID 0.1.5.10 capability of the Panther 5SE ensures data redundancy and performance. The EUROCOM Panther 5SE is driven by a complete line of optional 6 and 8 core Intel Xeon E5 Processors, based on the LGA 2011 processor socket, to offer customers top of the line performance, reliability and scalability for mission critical applications. The top of the line Intel Xeon E5-2690 has 8 cores, 16 threads, 20 MB of L3 cache, running at 2.9 GHz, supports Intel vPro Technology, Intel Virtualization Technology, Intel Hyper-Threading Technology and Intel Virtualization Technology for I/O. The Panther 5SE also supports storage expansion through the Optical Drive bay as it can be swapped out for an additional storage drive or can be used to backup data through the BluRay burner. Storage can be expanded through the eSATA port to an external storage medium as well.